At Eastern Virginia Orthodontics, we pride ourselves on helping our patients achieve healthy, beautiful smiles that will last them a lifetime. Our doctors and expert team work hard to make every patient feel at home, and we strive to design specialized treatment plans that perfectly suit our patients' unique orthodontic needs. While we see patients of all ages, none are more common than teenagers. In fact, braces are so common for teenagers that they've become something of a rite of passage - and there's good reason for this. Treating orthodontic issues during adolescence lets us take advantage of the natural growth processes that occur at this age, and the increased prevalence of braces for teenagers makes many patients excited (or at least more comfortable) about the idea of braces. In many ways, adolescence presents a golden opportunity for treating orthodontic problems, letting us design a beautiful smile that will last the rest of a patient's life. 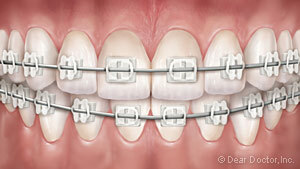 These are what most people think of when they hear the word "braces." They're sturdy, time-tested, and powerful. Today's races are smaller and lighter than ever. We can even offer customization options like specially colored elastic ties, letting you stylize your treatment to suit your own personal aesthetic. Invisalign does away with wires and brackets altogether, using a series of clear, removable trays, called aligners, to straighten teeth. 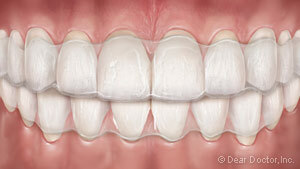 The aligners are virtually invisible when worn and can be popped in and out to eat, drink, brush, and floss. This means no one will know you're straightening your teeth. Maintaining proper oral hygiene is as easy as ever, and you'll have none of the dietary restrictions of traditional braces! If we need to make more significant changes to your teeth or jaw structure, we may recommend other appliances ranging from small devices that fit inside the mouth to external headgear. 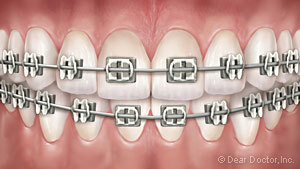 Some patients also benefit from a combination of braces and orthognathic surgery to address severe skeletal imbalances. Don't worry, though - these are temporary, and in the end, they'll help you secure a beautiful smile that will last you the rest of your life. The truth is that every patient is different: your treatment time will depend on your individual situation and the severity of your orthodontic issues. Usually, treatment lasts around 6 to 30 months. We know you'll be excited once you get your braces off, but you will need to wear a retainer at night afterwards. This will help your teeth finish settling into place, ensuring that your gorgeous new smile will stay with you for the rest of your life! Have more questions about our practice or the treatments we offer? We're here to answer them. Feel free to call us at 757-547-7002 or use our easy online form to schedule an appointment at any of our locations. We have offices in Chesapeake, Virginia Beach and Norfolk, so an appointment is never far away. We can't wait to hear from you, and we look forward to helping you achieve a beautiful, healthy, long-lasting smile!